Dear Classmates: Over the last several years, we’ve collectively experienced the loss of several classmates; others have struggled with family financial hardships due to things like prolonged illness. Given how close our class is, and being aware of the desire to help when we can, the board has developed a program to help our classmates in need - The Class of 1991 Support Fund. When considering options to assist our classmates, we went through several permutations of what that mechanism should look like. Upon reflection the simplest path was the best path. To that end, we’re instituting the following program to let the members of the Class of 1991 aid our fellow classmates. Find a way to support our classmates in need and remember those we have lost. Establish a fund to assist classmates and families with a compelling need. The Executive Leadership Board of the Class of 1991 will determine what constitutes a compelling need and the amount of the disbursement. For example, should a classmate pass away due to illness and the class want to contribute to a college fund for his/her children, or a classmate fall on some family financial hardship, the board can use the fund to pay out the given sum. The amount will be determined by the board. Once funds are disbursed, a fundraising drive will be held to replenish the fund. The initial goal is to raise $5,000 for the fund. Disbursement will be approved by a simple majority of a quorum of attendees at monthly board meetings. At least one executive member must be present to record the vote. The Sugar Bear Foundation has thoughtfully provided the funding conduit. For those that don’t know, the Sugar Bear Foundation was started to the honor the memory Lt. Col. Mario Carazo by his wife, Jennifer. The Class of 1991 Support Fund Page will facilitate collecting and distributing funds. We have a confidential request process. 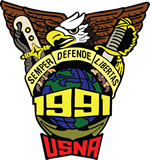 To make a request, please visit http://usna91.info/SupportFundRequest.aspx. The board will keep requests confidential. This simplifies the process. Instead of worrying about duplicate and redundant efforts by either family members of classmates or outside organizations, we will have a means to contribute funds on behalf of the Class of 1991 based on need. This shortens disbursement turnaround so the board and the class to can respond rapidly and effectively to help families. It does not limit who can be helped and why. Whether classmates are lost in the line of duty or not; whether they pass away or suffer from some critical illness, we have a platform to help. We can execute almost immediately. This is a simple solution. We won’t get bogged down in complexity and wonder who we’ll leave out. We simply help. We’re almost thirty years out from graduation. As we go forward, we want to make a difference. One way we can do that is by helping our classmates and their families at their times of greatest need. Please donate what you can to get this fund started. The folks we’ve lost are among the best of us all. It’s only fitting that we do our best to honor their memories by doing what we can, when we can.